Since 1973, we've had the opportunity to be a part of your jewelry-making experiences and cherish the relationships we've built with designer-artists, suppliers and employees. Discover what Fire Mountain Gems and Beads is all about... view recent press releases, see what we are up to in our local community, and read a collection of our favorite customer letters. You will also find current employment opportunities to join our growing family. Component mix, sterling silver, assorted shapes/sizes. Sold per pkg of 250 grams. 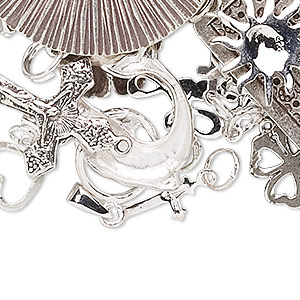 This mix has a wide variety of sterling silver components. Some components may include jumprings and/or enamel. Great for resale.